Although originally designed for varmint hunting, the 243 Winchester may be used for many big game animals such as deer and boar, as well. Many consider a bullet this small to be too light to strike down the larger game animals of the big game spectrum. However, this bullet is capable of killing elk and black bear as well. In addition, this Pointed Soft Point bullet is a bit heavier, weighing in at 100 grains, rather than the typical 85 to 95 grain, giving it an extra boost in terminal performance. 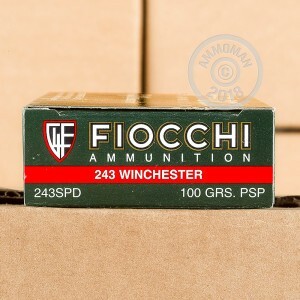 Fiocchi, as the longest standing weapons manufacturer in Italy, has an outstanding reputation. 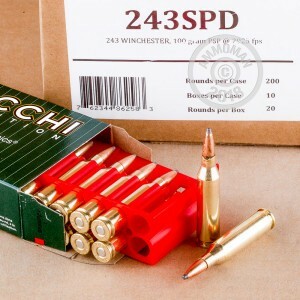 With this reputation, you can trust that your 243 Winchester PSP will outperform those made by other manufacturers. Buy a 20 round box today, or buy $99 or more and get free shipping!